EL SEGUNDO, CA-Sunday, July 9, was a big day for Jessica Elliott, who manages game entertainment for the Los Angeles Lakers. It was audition time. To many people, July represents summer fun and a cool down period of vacations, short getaways and activities. For Elliott, July represents the beginning of the start of a new NBA season. It is this time every year that the Laker Girls hold their annual tryout. Several hundred women from all over Southern California, dressed in dance attire, leotards and tights, lined up for their chance of chasing a dream at the Toyota Sports Complex. They signed registration forms, warmed-up and stretched and listened to instructions on the dance routines they were going to be asked to perform to see if they had the right moves to be part of this fraternity. The smiles, the pizzazz, the nuanced dance moves and the glamour go up a couple of notches when you watch the Laker Girls perform. The Laker Girls are the face of dance in the NBA. Surviving the cut, one round at a time, is a huge accomplishment. If you were good enough, you made it through the daylong tryout of elimination and moved on to the next round of auditions. If not, you went home unceremoniously with a sweat party being your best friend, plain and simple. Trying out to be a Laker Girl is no easy task. Britney Warren wanted to be that representative. She went through this process in 2016. She had an idea of what to expect this time around. Last year when she tried out for a spot on the Laker Girls roster, she got too caught up in the moment and auditioned with a lot of pent-up nerves that took over her ability to perform on cue. This time around, the ballet-driven dancer said she was determined to let loose, perform and let the chips lay where they may. For Brandi Cooper, going out to be part of a professional sports team dance squad is quite different from the world that’s she’s used. She’s a natural when it comes to cheering. Being a cheerleader is something that is old hat for Cooper. But as she found out when she auditioned to be part of the Charger Girls, the movements required to make a sports team dance roster is upside down from she’s done in the past. It kind of makes things easier when you’re trying out for a dance team that is part of an organization that our family adores. Cooper said that her grandmother is a huge fan of the Purple and Gold. 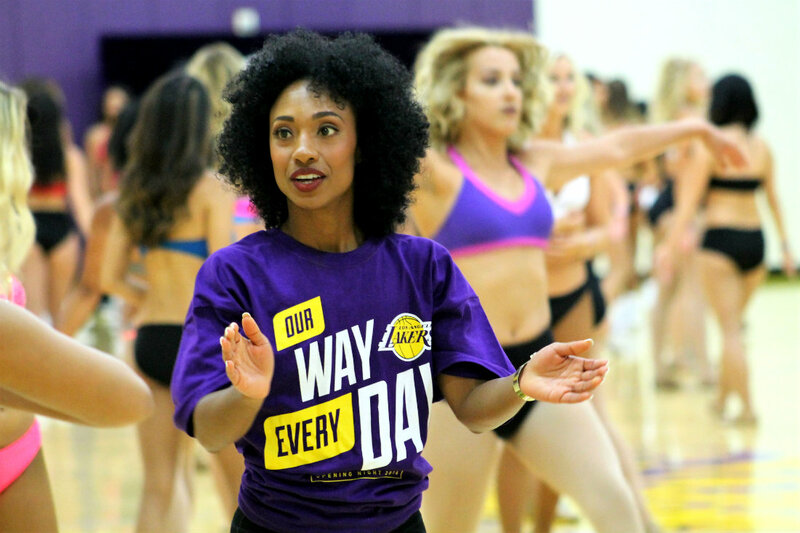 So, the combination of her grandmother’s passion for the Lakers, along with her cheerleading background, gave her the confidence to try out, she said. Elliott, who also serves as manager of the Laker Girls, said the audition is something many of the participants have always wanted to do. Being a Laker Girl would simply be a dream come true for them, she said.